Representative Alfred Rush. The year and place of his birth is unknown to posterity, but in the 1833 U.S. Census, Alfred Rush was found to be the property of Edmund Gee; son of John Gee, one of the first magistrates in Darlington District, present day Florence, S.C., Ebenezer District - with his homestead near Five Points. 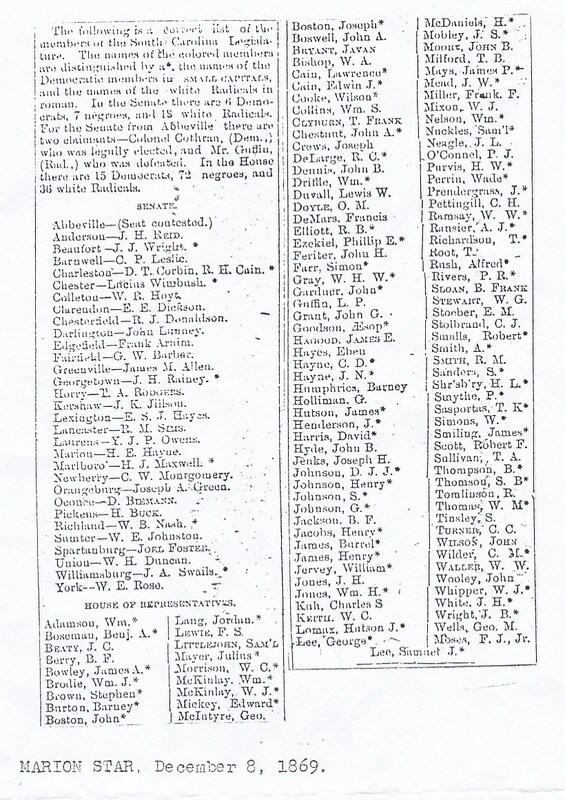 His Brother-in Law, Horatio "Rasha" Cannon was a Senator for Darlington District for over 20-years. He was married to his sister, Parmelia Gee, and wrote a charter for the State Bank of South Carolina. The Gee Family, was very well connected family, and part of the Darlington Distict Aristocracy or Planters Class. Edmund Gee served as an Attorney in Darlington employing Alfred Rush; his man-servant; as a farmer, blacksmith, gin, and mill operator on the Gee Plantation earning him trust and responsibility. It was noted early on in his youth that young Alfred had a rarified skill not often found among slaves; he could read. From 1826-1828, Edmund Gee served Darlington in the S.C. House of Representatives. It was during this period while serving in Columbia, S.C., with young Alfred, Rep. Gee planted the seeds of a future life that he could not even fathom in the late 1820s and early 1830s in the Ante-bellum South. Due to his stewardship and attention to detail as noted from his many responsibilities, his future appeared to be bright. 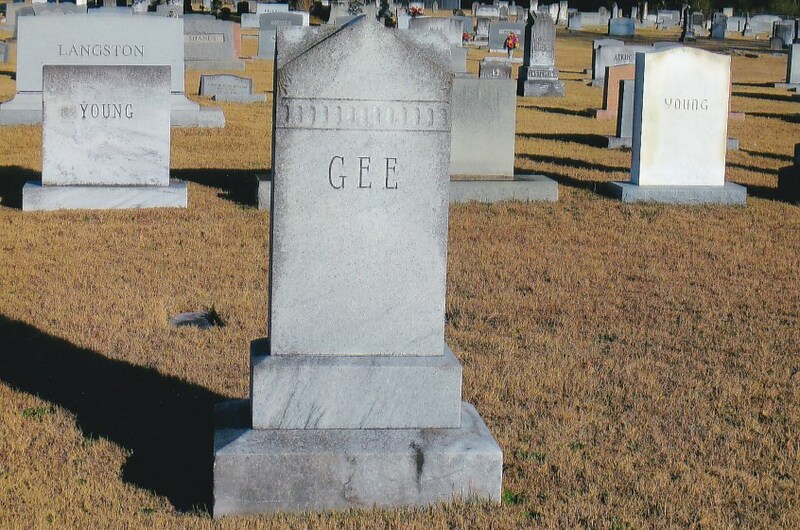 His character molding and christian upbringing were not only attributed to Edmund Gee but also his wife, Martha Harriet Blackwell Gee called "Hannah", Edmund's Brother, Jacquilling "Jack" Gee, and Mother Ebenezer Baptist Church. After the death of Edmund Gee in 1830, Jack hired Alfred Rush from his brother’s estate to become his most trusted manservant. As found with Edmund and Widow Hannah, Alfred oversaw many chores due to the plantation’s many operations which included the storehouse, smokehouse, milkhouse, rootcellar house, pantry, and toolhouse. Armed with an ample supply of keys, exemplifying trust, Alfred continued to mature in all of his endeavors due to his fidelity, trustworthiness, and good character which many in the Gee Clan desired from their holdings. The relationship between Jack Gee and Alfred Rush lasted from slavery up until and [well after] emancipation. Alfred Rush continued in the employment of Jack Gee as overseer, long after he had purchased his own plantation in the Savannah Grove-Meadow Prong community in 1869. In May 1848, Alfred was brought before the Ebenezer Baptist Church, as a candidate for baptism, as being slave [of] Jack Gee as noted as “Jack”. Later he was given approval to teach or minister to the slave congregation at Ebenezer Baptist Church, as a Slave Deacon, around 1860. He, along with Sampson Ham – a full-time licensee of the church ministered to the slaves - helped minister the Gospel to their captive brethren. During the Civil War, and shortly thereafter, Alfred was found at his stay as man-servant to Jack Gee. The christian edicts and moral underpinnings taught by Mother Ebenezer to Alfred and fellow slave converts, helped insure this period of "great upheaval" was one of respect. On November 3, 1866, due to the Civil War's aftermath, Pastor Sampson Ham, Deacon Alfred Rush, and 11 other souls were granted a letter of dismission to join the black church in Darlington. On November 3, 1866, Savannah Grove Baptist Church, was birthed on land donated by George W. Pettigrew. Despite the tragedy and trauma rendered by the war, mutual respect between Master and Slave, Jack Gee and Alfred Rush, continued until the former's death on February 4, 1872. 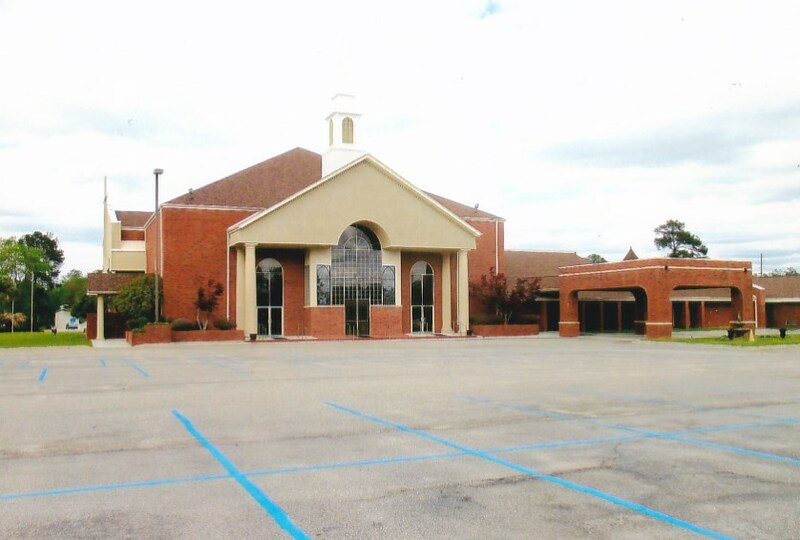 Mother Ebenezer Baptist Church Campus. The upheaval caused by the war and the 1865 Election, sought to re-institute a government that resembled the anti-bellum rule found prior to the war, as envisioned by Abraham Lincoln, the Architect of the Presidential Reconstruction Act, and implemented by Vice President Andrew Johnson instituted a softer more forgiving remedy, allowing for the immediate restoration of the “old-rule” and newly instituted Black Codes. Thus, forsaking the newly freedmen with no protection and scarcity of resources to the ill-will of their former masters. In essence, the election of 1865 throughout the South, made those of African-descent slaves, if not with chains, by circumstance, once again, infuriating Radical Republicans in Congress, prompting the Congressional Reconstruction Act, which sougth to enact and enforce by law, what the Presidentional Reconstruction Act failed to do. In 1868, Alfred Rush; with the help of the Gee Family and its powerful political connections, was elected during South Carolina’s First Reconstruction Government, the “Forty-Eighth General Assembly”, under the administration of Governor Robert B. Scott. As a member of the House of Representatives, Representative Alfred Rush and fellow legislators, introduced legislations that were passed into law for the state of South Carolina to create and maintain a free Public School System, for all races and classes, with equal access to all Public Schools and Colleges. This was the single most important achievement or contribution made by the Honorable Alfred Rush and the “Forty-Eighth General Assembly” of South Carolina, and is worthy of note distinction, by all benefactors past and present. Rep. Alfred Rush's December 1869 Election Notice. Alfred Rush and the First African-American Legislative Body to serve our state during the period of Reconstruction. School Teacher in the early 1880s, in Darlington County, wihin the Effingham Community. As the writer of Ecclesiastes would pen many centuries ago to the finality of this life, there is a time to live and a time to die. On the evening of May 13, 1876, Rep. Alfred Rush and his wife, Aggy, were returning home in their horsedrawn buggy from a re-election campaign at Mt. Carmel Baptist Church when they stopped at the Long Branch Stream to water their horse, about a one and half miles, from their home. It was just before sunset. Suddenly, gunshots rang out from behind a nearby tree stump. An assassin's bullet struck Rep. Alfred Rush in the heart, killing him instantly. 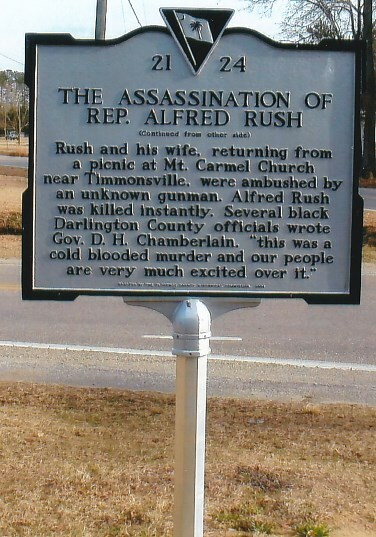 Rep. Alfred Rush Historical Marker - side 1. Rep. Alfred Rush Historical Marker - side 2.
of education, the educational process in both Community and Church, and in one's life, which has remained steadfast and unmovable. 1866 – Savannah Grove Baptist Church, Darlington, South Carolina established on November 3, 1866. 1868 – Crop Lien Agreement with General Robert K. Scott, Charleston, South Carolina, April 27, 1868. - Voters Registration, Timmonsville Precinct, Darlington, South Carolina, June 30, 1868. - Purchased Plantation at Effingham, South Carolina, Darlington County, July 23, 1869. - One of the first deacons at Savannah Grove Baptist Church, Tansbay Township, Darlington, South Carolina, August 15, 1869. - Tax forfeitures of Property, Rush Township, a list of 21 Farms are published, Darlington, South Carolina, October 31, 1875. 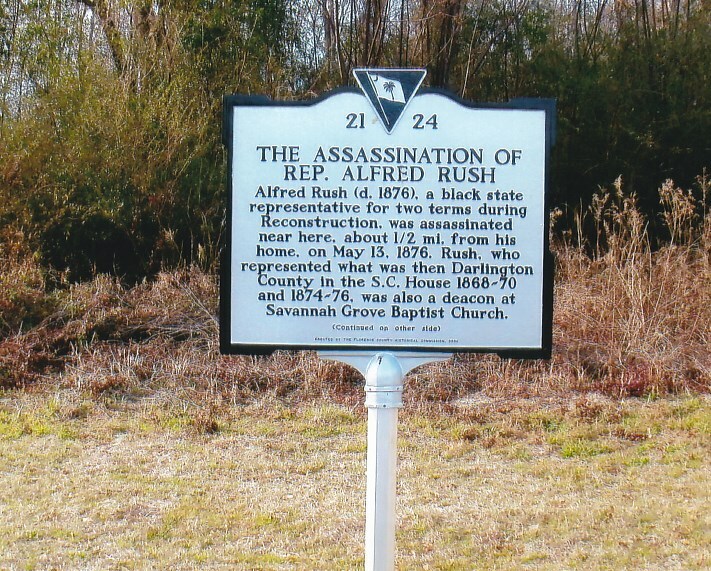 - Representative Alfred Rush is assassinated in Rush Township, Darlington, South Carolina, May 13, 1876.